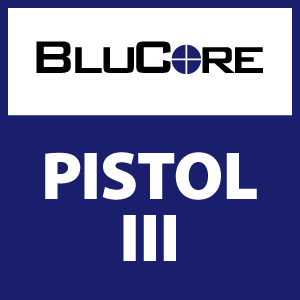 The BluCore Pistol III class is for advanced tactical pistol shooters only. Students will quickly review the primary skills learned in our Pistol II class (a prerequisite), and then expand upon them. This course will cover advanced tactical pistol skills such as the use of barricades and atypical shooting positions. The drills we use and the skills we teach are used by members of the US Special Operations community. Most drills will start from the holstered position and include: engaging multiple targets, combat & tactical reloads, strong/support hand shooting, shooting while moving, use of barricades, shooting from atypical positions, and shooting while under stress of time or physical stress. This course is approximately 3.5 hours long and includes a limited classroom portion and 2+ hours on the range. To maximize range time, this class is limited to eight participants. Requirements: This is an advanced skills class, previous firearms experience is necessary! Students will need to have taken our BluCore Pistol II class and have performed at a high level. You must be very comfortable and proficient with your handgun in order to get the most out of this course. Each student will need their pistol along with approximately 250 rounds of ammunition. Students will also need a pistol kydex OWB holster, magazine pouches and at least 3 magazines. Students may bring their own ammunition or purchase from us.